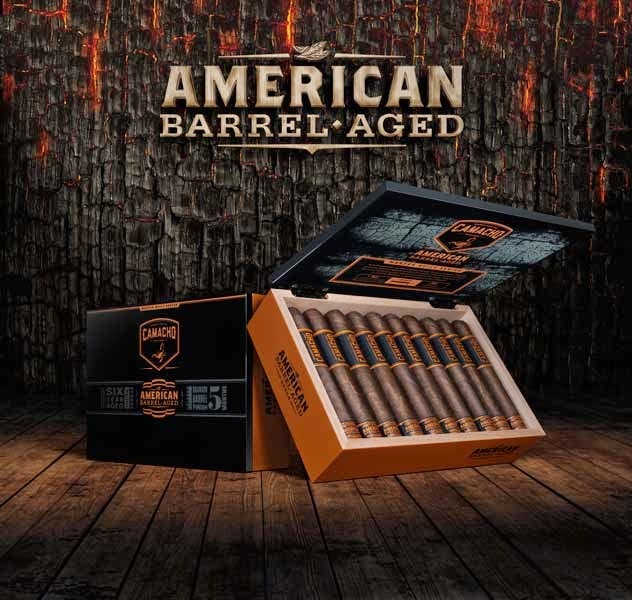 Camacho, the worlds leading brand of bold cigars, is proud to announce the first release under it’s new Master Built Series, Camacho American Barrel-Aged. A complex and intense new cigar experience inspired by the uncompromising American spirit, with bourbon barrel-aged Corojo at its heart. American Barrel-Aged is a monumental smoke that welds the essence of true frontier mettle to Camacho’s impenetrable Cuban roots. An experience that shatters all expectations, pushes every limit and paves the way for a life lived out loud. With the spirit of America and the soul of a craftsman, Camacho American Barrel-Aged celebrates the hardworking grit of Kentucky bourbon makers and the passionate artistry of our master builders. Challenging convention at every turn.Working together to forge an intense smoking experience unlike anything else. A process that begins with the original Corojo plant, aging its legendary leaves for six years and then locking them in charred Kentucky bourbon barrels. Wrapped in five-year-old American broadleaf, each cigar delivers a richness and complexity characterized by oaky flavors and sweet bourbon aromas. American Barrel-Aged is truly the embodiment of uncompromising craftsmanship. Born from the inexhaustible spirit that has inspired Camacho from day one. “American Barrel-Aged is something we have been working on for some time and we are very excited to finally share it with aficionados now in the US and across global markets in the near future. This project marks the first time a Camacho core line has been made outside of Honduras and we are extremely proud of what our master builders in the Dominican Republic have brought to life. Barrel aging is a very tedious and hands-on process. We are aging around 2,000 lbs of Corojo filler tobacco and rotating the barrels one leaf at a time every few weeks. Each batch takes a full five months to complete and requires constant attention to ensure the proper journey for this special tobacco,” said Dylan Austin, Director of Marketing for Davidoff of Geneva USA. The blend is constructed almost entirely of American grown tobacco including a broadleaf wrapper, binder and filler, along with a maduro filler tobacco from Pennsylvania. 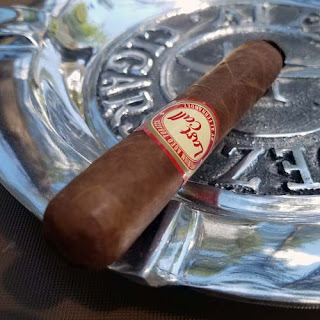 One leaf of the six-year-old, bourbon barrel-aged Corojo tobacco was added to the recipe and is the main component that amplifies the complexity of the blend. To intensify the launch of American Barrel-Aged, a full nationwide road tour is in the works and will kickoff with a weeklongextravaganza at Corona Cigar in Orlando starting on June 8th. Each of the American Barrel-Aged launch events will span across three days and are limited to a group of twenty-five hand selected retailers. The grand finale event will be held at Tampa Humidor in Tampa, FL on December 19th where the tour will come to a close. American Barrel-Aged will begin shipping nationwide on Monday, June 15th and retails for $10 - $12 per cigar. Camacho is the world’s leading brand of bold cigars, representing the concept of unleashing unmistakable and intense experiences. Infamous since 1962, the brand has become a sanctuary for the powerful, elemental being who seeks to fill their lives with unapologetic good times. A combination of rich heritage, product excellence and a never surrender attitude has enabled Camacho to grow into an aggressive brand globally recognized as the standard of full-frontal flavor and full-frontal lifestyle. (Miami, Florida) April 22, 2015— A.J. Fernandez Cigars, known for producing consistently highly rated cigars is set to release the exceedingly anticipated New World Connecticut. The unique blend was created after the overwhelmingly positive response from the public and critics alike, when New World was unveiled at the 2014 IPCPR. The New World went on to attain the honor of Number 1 Cigar in the World 2014 by Cigar Journal Magazine. Master blender A.J. Fernandez created the New World brand to pay homage to the discovery of the “mystical smoking leaf” named tobacco by the Europeans, when their ships landed in what is now known as the New World. In November 1492, Jerez and Luis de Torres first observed natives smoking as they were searching for the Emperor of China. Unaware that they had landed in modern-day Cuba, they encountered natives that created rolls made of palm and maize leaves, in the shape of a musket constructed of paper with tobacco on the inside. One would light one end and enjoy the smoke out of the other. The New World Connecticut is a medium bodied cigar. Unlike the original New World, it will not be box pressed. 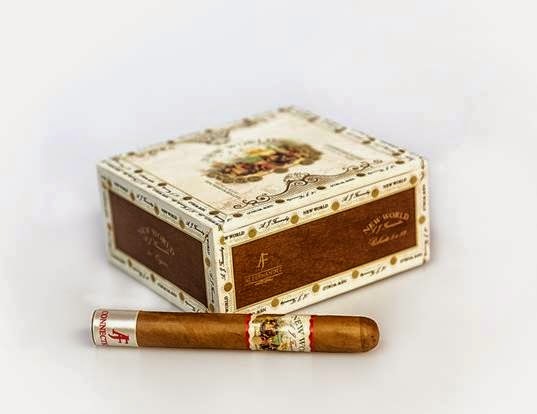 Smokers of the New World Connecticut will experience notes of cream, wood, and almonds in a very well balanced and refined cigar. The MSRP for the New World Connecticut will stay in line with the original New World at six dollars. The New World Connecticut will begin shipping to your favorite tobacco shop in May. 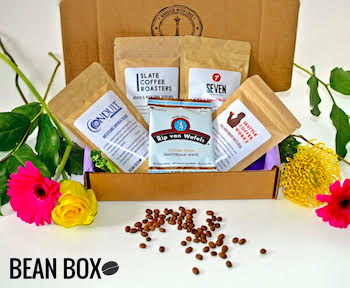 The Bean Box is a special coffee experience. We hand-pick freshly roasted coffee from Seattle’s top-rated roasters and deliver them to your door. For Mother’s Day, we’re pairing our delicious coffees with an equally scrumptious Rip van Wafel cookie. Make your Mother’s Day gift last with a 1, 3, 6, or 12-month Seattle coffee tour. LOS ANGELES, CA (APRIL 8th, 2015) –– Camacho Cigars and Rob Weiss are proud to introduce the BG Meyer Gigantes, an exciting new line extension and third addition to the BG Meyer by Camacho collaborative portfolio. 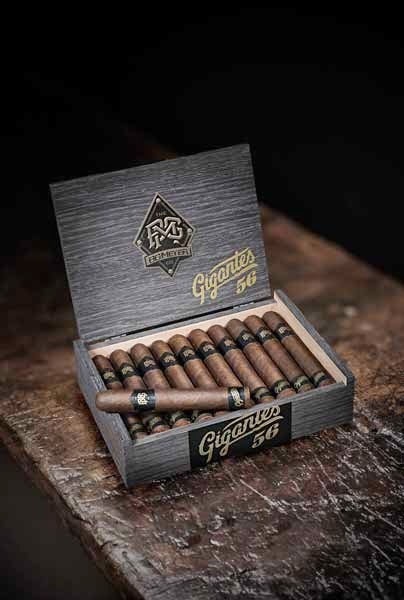 Gigantes, which will begin shipping nationwide in mid-April, is set to debut on the heels of Cigar Aficionado’s 90-point rating of the BG Meyer Standard Issue; the first release by Camacho and Rob Weiss. “The new BG Meyer Gigantes pays tribute to those towering spirits that have lead us to action by example. Titans of character. Fearless pioneers. Those legends that influence our lives. Inspire our own personal journey. They are giants that walk among us and we celebrate them. As we do you, those who dare to blaze a trail in creating a legend of their own,” said Rob Weiss. The concept for the cigar comes as a play on the legendary Gigante, which is traditionally a format known for robust flavors. The combination of larger ring gauges, along with a hearty Nicaraguan-grown Habano wrapper make the new Gigantes a unique new addition to the portfolio. 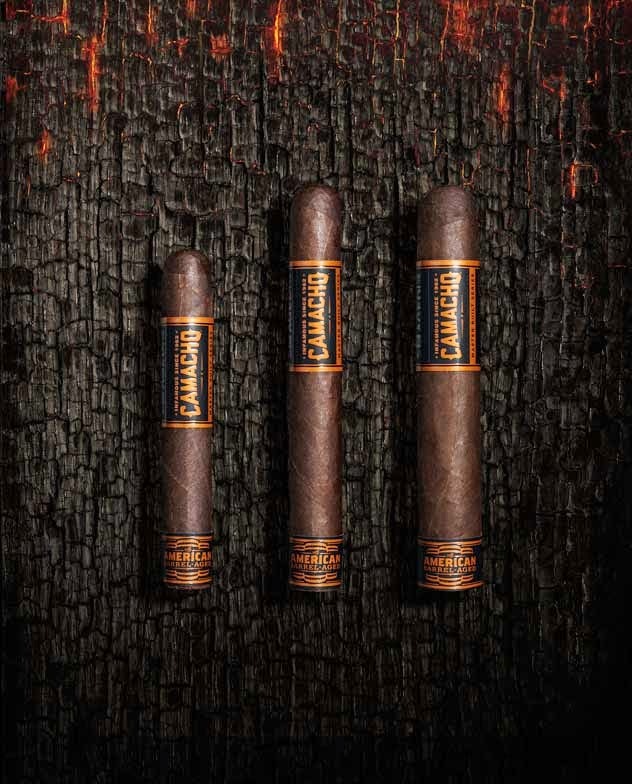 A notch above medium in intensity, the new Gigantes features a Brazil Mata Fina binder and high-grade filler tobaccos from both Nicaragua and the Dominican Republic. The binder and filler tobaccos in the Gigantes blend have been aged at minimum six years, while the wrapper has been at rest since 2007. Dressed in 20ct boxes that have been draped with black Oak veneer, the new line will begin shipping on Wednesday, April 15th and is set to retail from $10.00 - $13.00 per cigar. The BG Meyer Gigantes comes in four formats: 52 x 4, 54 x 5, 56 x 6 and 60 x 7. All BG Meyer cigars are hand-built at AgroIndustrias Laepe, S.A. in Danli, Honduras. Rob Weiss is an American film and television director/writer/producer. Weiss was born in Brooklyn, New York, and raised in Baldwin, Long Island, as well as The Five Towns. He attended the Parsons School of Design, studying fashion and film. Working his way through school as a club promoter on Long Island and New York City, he threw parties at some of NYC’s most legendary venues: Palladium, Tunnel, Limelight, the MilkBar and Heartbreaks. Weiss’s first film was 1993’s Sundance hit Amongst Friends, which he wrote and directed. The film was nominated for the festival Grand Jury Prize and lost the audience award by a decimal point to Robert Rodriguez’s ‘El Mariachi’. Rob went on to write and produce numerous projects including HBOs Entourage, How To Make It In America and currently Ballers, starring Dwayne ‘The Rock’ Johnson. Weiss has been the subject of two New York Times Arts and Leisure profiles. In an August 2007 New York Observer interview with Entourage’s Doug Ellin, he confirmed that Weiss was the basis for the character of Billy Walsh, a perfectionist filmmaker who was a recurring character on the Entourage series. Ellin even asked Weiss to play "Walsh,” but Weiss declined. Instead, the role went to Rhys Coiro, to whom Weiss bears little outward resemblance. Weiss is also currently producing a mini series adaptation of the novel ‘Pimp’ by Iceberg Slim for HBO and is writing/directing ‘Hells Angel’ for Fox 2000, a feature film chronicling the early days of the legendary motorcycle club and it’s visionary patriarch, Ralph ‘Sonny’ Barger. For more information on the BG Meyer follow us on Facebook, Twitter and Instagram. Back a couple of weeks I reviewed The Belvedere ™ Smart Smoke® E-Cigar and found it to be a top-notch vaping product. Today we take a look at the original flavor Belvedere Slim™. Can this smaller version match the performance and equal the 9.8 rating earned in the previous review? Well let's take a look and find out. Weighing in at just .6 ounces this lightweight e-cigar still packs a big punch. The Belvedere Slim™ measures about 4 3/4" by 32 ring and has many of the same features found in The Belvedere ™. It has the same durable tobacco leaf pattern wrapper that shows no wear after several hours of use and like it's big brother, the bite area is soft and flexible. That allows this model to easily be held between the teeth for hands free vaping. Again this Smart Smoke® E-Cigar has flavor notes reminiscent of fermented tobacco, brown sugar and a hint of rum. This good tasting flavor mix reminds me of a very mild Connecticut wrapped cigar. While there are many key features to this e-cigar, it's the vapor volume that makes this model shine. It produces huge amounts of vapor. In fact it produces more vapor than any e-cigar I've previously tested, even its big brother. Overall I thought The Belvedere Slim™ was an impressive product. It's feature rich, it has great tasting flavors and it produces a huge volume of vapor. Priced at $11.99 this 500 puff model is advertised on SmartSmoke.com to be the equivalent of 6 slim cigars. I'm pretty sure that I'm over 500 puffs on mine and that's a real deal. Go ahead, check out SmartSmoke.com and see what you think. I think lots of coffee drinkers enjoy iced coffee from time-to-time, I definitely do. Normally to make iced coffee I do a pour-over then pour the hot coffee over ice. While this is pretty tasty, it does severely dilute the coffee. 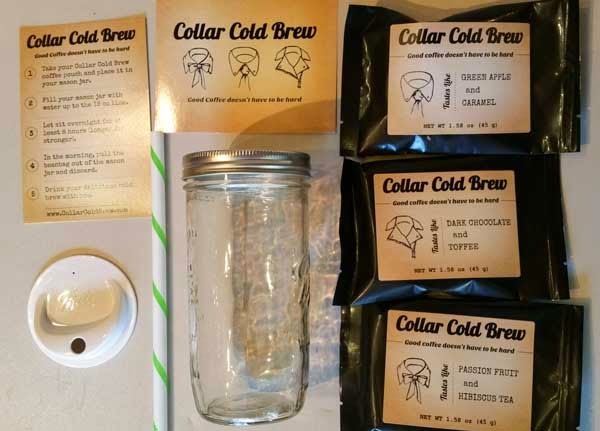 A few weeks ago I ran across this Collar Cold Brew Starter Kit and thought to myself "hey this is a pretty good idea". So here we are taking the kit for a test drive. 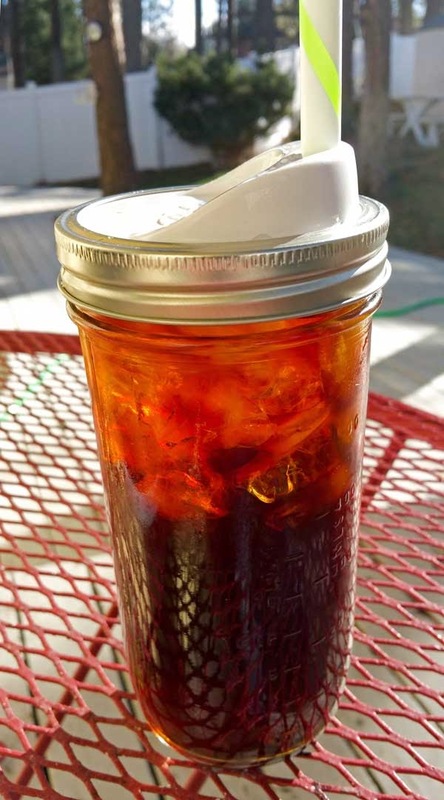 The Cold brew kit comes with everything you need to cold-brew coffee other than the water. Starting out at $14.95 you get three pouches of flavored coffee, a glass jar with two lids, a reusable straw and a well written instruction card. Each pouch contains the proper amount of coffee to brew two cups of coffee. To brew, simply add a coffee pouch to the glass jar, fill it with cold water, put on the lid and let it do the magic over night. In the morning you have two cups of cold-brew coffee ready to drink. Below are the reviews of each of the three coffee flavors. From the bag there was a robust aroma of toffee. After brewing over night and adding ice, the coffee had an aroma mix of cocoa, caramel and nuts. The first sips were smooth with a light creamy mouthfeel with flavors of bitter-sweet chocolate and toffee. From the bag there were smooth notes of caramel to the nose. Once brewed there were lightly tart notes of green apple mixed with hints of sweet caramel. The coffee was crisp and light with a cleansing palate wash leaving behind a light green apple aftertastes. This coffee created a smooth and creamy brew with mouthwatering notes of cocoa and light citrus. 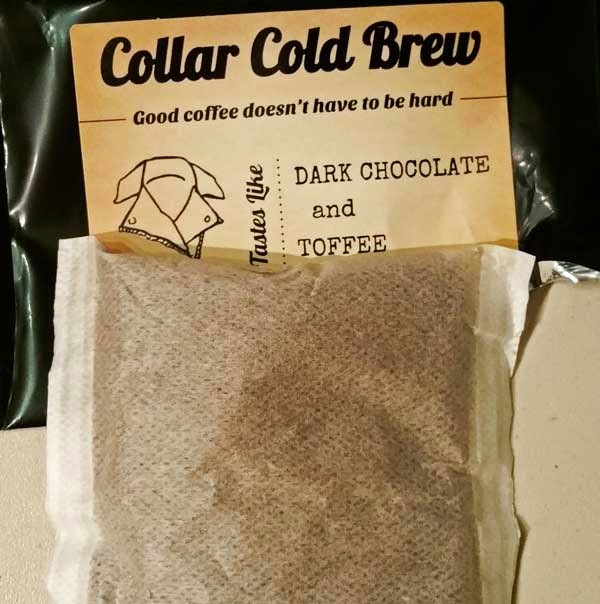 Overall I think the Collar Cold Brew Kit is a fantastic idea. For $14.95 you can make six cups of great tasting cold-brew coffee that doesn't get diluted when you add ice. Plus I have a reusable jar that can be used with other cold drinks all summer long. Check out their website and see what you think.